I couldn't agree more. That's why I tried to qualify my opinion with noting it's more about midi. I just have a very unique approach. If it needs another device, or PC it doesn't fit my needs well. I certainly don't suggest it's a bad thing. It's just not in my workflow if there's no copy paste. I hope no one takes that Casio keyboard thing too seriously, or with negative implication. It's not intended that way. It was an honest impression of the internal sounds. Which isn't a bad thing. Anyway it was more tongue n cheek while reiterating it's more about midi not presets. I love Polychord. For those using midi it's an outstanding tool. I don't use midi. I'm all about leaving other devices, hardware and the likes behind in favor of just my iPad. It's my odd niche. All music is beautiful, and important. I'm right on the same page, I haven't figured out MIDI yet and don't have much use for it at the moment. I love playing with Polychord and wish I could get my hands on a hardware version! Like the old Omnichord but with the new spiffed-up buttons, if it would still make sense to your fingers in 3D. I also thought it was weird and disappointing that they didn't include some sort of audiocopy. I would love to play around mixing Polychord sounds with various other apps, but I only want to record in iOS. I'd be fine with the built-in sounds if only I could get them out of that app, for multitracking or what have you. Maybe/hopefully in the next version? Smite, I think you should see this video on youtube that shows that you can access the sounds of other iOS apps like SampleWiz via MIDI all WITHIN an iPad. http://www.youtube.com/watch?v=hluhW7wamDs&feature=player_detailpageI know this works because I did it for the first time earlier today. Try it, I think it will really open up Polycord for you! 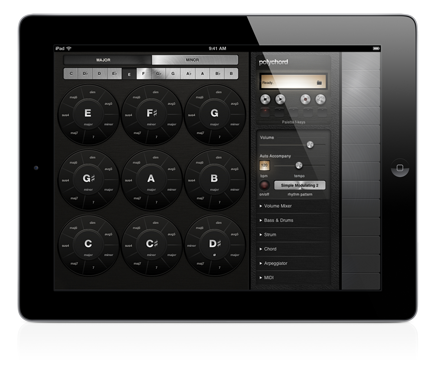 I'm actually looking to find other iOS apps that can slave to Polychords via the iPad's internal MIDI syncing. Thank you Gary! I didnt know this has virtual core MIDI too! awesome! !